This is part of an ongoing series of reviews here at GPS. These will be (to the best of my ability) spoiler-free, so as not to ruin the fiction ones I do, as well as relatively brief. If you’re interested, I’ve actually been tracking exactly what I’ve read (book and GN-wise, anyway) for over the past four years on LibraryThing. Full disclosure: I was sent a pre-publication electronic copy of this book from the author, and provided a blurb for the book. James A. Lindsay, Ph.D. is a physicist, mathematician, blogger, and author of two prior books, most recently Dot, Dot, Dot: Infinity Plus God Equals Folly . His newest, just out this month, is called Everybody is Wrong about God and has a forward by philosopher Peter Boghossian (author of A Manual for Creating Atheists ). The basic takeaway from this book is that theology is dead, God is real, atheism doesn’t make sense, and society needs to become post-theistic. While these statements initially seem at odds with each other, Lindsay expertly demonstrates how all are true, in a writing style that can best be described as writing mathematically about philosophy. For instance, drawing from large amount of the psychological and philosophical literature, he convincingly argues that “God” is indeed real, but not as operationally defined by most people. Instead, he shows “God” to be a moral and psychological construct developed to fit specific kinds of human needs. This is not a book for the intellectually faint of heart, as Lindsay convincingly challenges both believers and non-believers to change the way they think and talk about the concept of “God.” I would highly recommended this book for those who have tired of reading the same “God isn’t real” arguments for the past few decades and want to instead understand, at least in part, why so many believers could care less about the scientific case against God. 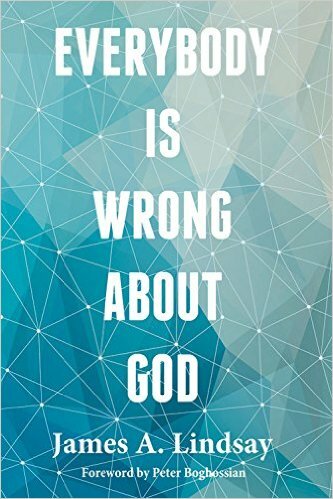 Buy Everybody Is Wrong About God from Amazon now. This book sounds very interesting. Thanks for the review! Have the specific kinds of human needs which “God” was originally (psychologically or socially) constructed to meet faded away yet? Oh no, and (the book argues and I agree) they never will. Presumably, then, we must to come up with alternative ways to satisfy these needs. Yes, the book seeks to open the lines of conversation about what these might be, claiming that they are better to come from a secular stance. It’s a really good book which I consulted on for some of the draft manuscript work. Get it! Not yet read the book, so this isn’t a comment on the book but a comment on the idea that God is real as a moral and psychological construct developed to fit specific kinds of human needs. But, God as moral and psychological construct developed to fit specific kinds of human needs itself sounds like a psychological construct to excuse a pseudo-reality for God. It isn’t God that’s real, any more than unicorns as a psychological construct developed to fit specific kind of human need for a mystical pet are real. The reality is that brains do this thing whereby they convince themselves that some of their complex brain phenomenal experience represents some external stuff, but that stuff doesn’t actually exist. More rational brains recognise the non-reality of the stuff and call it abstraction, or imagination, depending on the context. It’s not God that’s real, but the brain experience of what is imagined, this God, plus the brain conviction that it’s real. I can imagine God. But with the lack of supporting evidence I don’t suffer the conviction that it’s real outside that imaginative context. 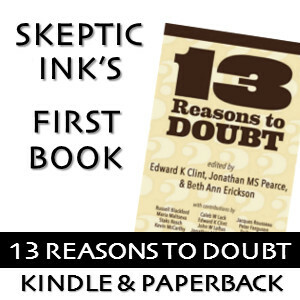 Perhaps “God is real” is just a good hook for the doubting and/or ‘sophisticated’ religious to make them read the book. Which I will do too. Thanks for the heads up on it. I think you’ll quite enjoy it! I have a few quarrels and quibbles with material in chapter one, though it may be I’m merely confused on what the author is really getting at here. Since God seems not to exist and “God” so clearly serves a psychosocial role for believers, they are left with little to protect theism from the charge that it is, indeed, a form of mythology metaphorically representing abstract ideas applied to our psychosocial needs. Metaphors are consciously constructed in the knowledge that they are not literal models of how reality actually works. Theism is no metaphor, it is the assertion that at least one powerful immaterial mysterious mind really exists. Every time someone says that he believes in God, he’s saying that he has psychological or social needs that he doesn’t know how to meet. I used to believe in God, and I’m around 99.9% confident that whenever I affirmed this belief aloud, I was not trying to convey any information about my unmet psychological or social needs. I will say Chapter 1 was the hardest to get through, as he’s trying to lay groundwork for everything else in the book. I think he explains his thesis much better across the rest of the book. I think that James would answer that he is not talking about conscious, explicit conveying of information, but that rather believing in a god(s) was in and of itself the result of having unmet needs (or needs that were only being met as part of a religious community). I have a few quarrels with chapter two, as well. The atheism movement is little more than a loose confederation of disparate, motivated, and disagreeable moral communities that have the diminution of religious belief and influence as the only thing like a goal held in common, and that only roughly. Seen this way, as it is, immediately makes clear why it’s such a horrible idea. Here, the author says “horrible” where I would have said “awesome.” It is only after the diminution of religious belief and influence that we can build a society which isn’t constantly being distracted by faith-based attempts to drag morality back into the Bronze Age. Moreover, the fact that we atheists constantly argue amongst ourselves about all other matters strikes me as a feature rather than a bug. The philosophical defenses of theism exist to satisfy the inner lawyers of believers so they can feel rational about maintaining beliefs held for other reasons. This is true, but it should be taken as a reason to keep on “fighting a philsophical fight” rather than giving it up, as Lindsay counsels. Those who have inner judges as well as inner lawyers will be able to recognize when they’ve truly lost the argument, and it would be uncharitable to give up on them without first showing them how philosophically bankrupt theistic rationalizations have become. If it weren’t for philosophically-minded atheists like Nicholas Tattersall and Ted Drange, I would still be an evangelical Christian to this day. I will always be grateful that they didn’t give up on people with stubborn inner lawyers like myself.